Lovely and serene and I love two here. So glad to see your gorgeous creations again! Happy Thanksgiving! So pretty! What a great way to relax. I draw Zentangles to relax. My watercolor skills (or lack thereof) generally stress me out, LOL!You have a gift for watercolor, Joan. Thanks for sharing it with us this Thanksgiving. Mwah!! lovely watercoloring and so good to see you posting again. Beautiful! Miss your posts! Hope you are feeling better. Just beautiful... You always inspire me. I think two are perfect! You do the best watercolors. There is something so relaxing about watercoloring. It makes me happy to see a post from you, Joan. This is so beautiful Joan! Glad you are back to watercoloring - you are so good at it! Oh my gosh, Joan, this is stunning! So glad it was relaxing for you! What a delight to see your post in my inbox! 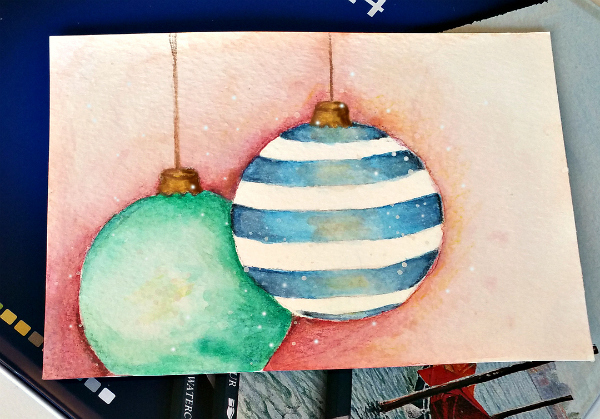 I don't 'miss' the third ornament and your water coloring is divine. I'm hoping that this post means you are on the upside at this time and can enjoy the season we are in. Gorgeous! Hope you're feeling better! Fun and pretty too! Who cares if the "numbers" aren't what others want, your creation can be EXACTLY what you want it to be!